A warm, filling soup – perfect on a chilly evening with some crusty, gluten free bread (why not try the potato bread recipe? You’ll find it in the search bar). Roasting the vegetables in the oven before adding to the soup, brings out some wonderful strong flavours. Add the pecans and coconut for some nice crunch. 2. Drizzle with olive oil, vinegar, chili flakes, juice and salt. 4. Deglaze the oven pan with some of the above water (pour the liquid into the hot pan and stir to release the flavours that have stuck to the bottom of the pan). 5. In a saucepan, add most of the milk and water (including the deglazing liquid) with the veggies and let simmer for 15 minutes. 6. Using a handheld mixer, purée until completely smooth. If too thick, add some more liquid. 7. Taste and add more chili or juice, as needed. 8. In a dry pan, toast the pecans and coconut, add some salt. A wonderful, easy, quick, delicious recipe! Serve as a starter, lunch or, with some bread, for dinner. 1. Cut the zucchini into thick slices. Place in a saucepan along with the vegetable broth and salt. 2. Simmer 15-20 minutes until the zucchini is soft. 4. Add some more broth if you prefer a thinner soup. Reheat if the soup got too cool. 5. Season with more salt and pepper, if needed. A drop of agave or maple syrup can help balance the flavours. 6. 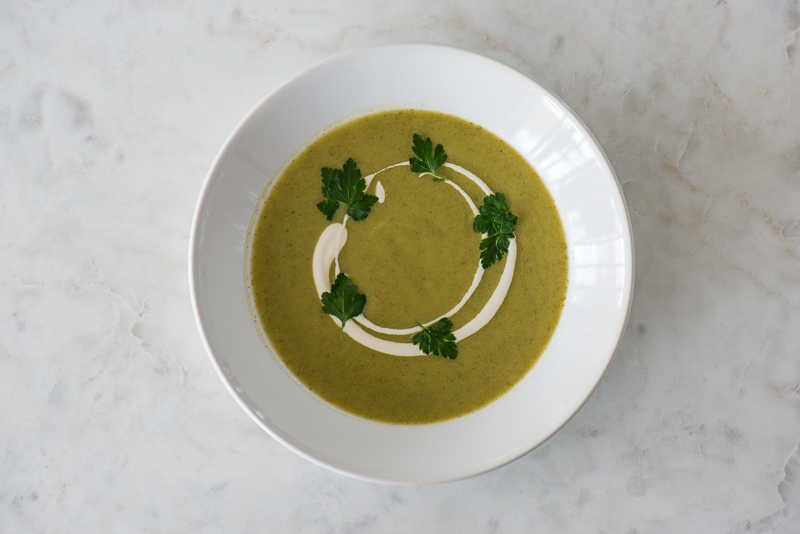 Pour into serving bowls, drizzle sour cream and add some parsley leaves. Don’t know what to do with your overripe kiwis? 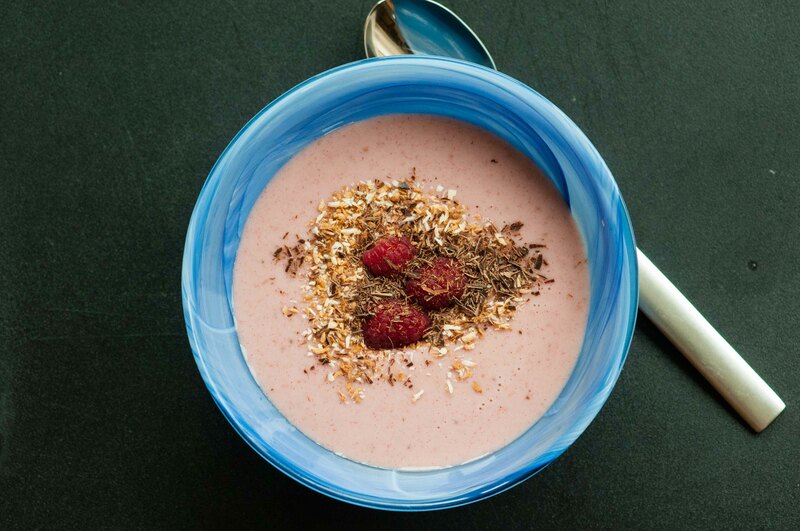 This recipe makes for a light and delicious dessert soup. If you can get hold of yellow/golden kiwis, they are really good in this soup. 2. For a creamier taste, add a bit of coconut milk – about 50 ml – optional. 4. 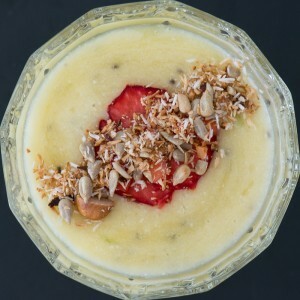 Serve with dehydrated strawberry slices, finely diced strawberry pieces and grated coconut. For more of a crunch, you can also add a toasted mix of chopped almonds, sunflower seeds and coconut. Combine the three in a dry pan and toast with some salt. Let cool. I was served this amazing soup in a Spanish tapas bar and loved the lemon grass flavour together with the octopus. The recipe below is a recreation of that dish. Unfortunatly, when recreating this, I did not have my ISI Whipper nearby but if you have one, then just strain the soup, pour it into the canister, charge with 1 cream charger and discharge into the soup bowl. Add the octopus and chopped chili. Creating a foam of the soup gives another, very interesting, texture to this soup. 100 ml whipping cream/double cream. 1. Boil the potato with the kaffir lime, chili and the lemon grass in the water. 2. Puree using an immersion blender. 3. Add the salt and pepper, lime juice and cream. 4. Heat and then whisk to create a bit of a foam. 5. Heat the octopus in the soup or in a separate pan (depending if it is pre-cooked or raw). 6. Place in serving bowls and decorate with the chopped chili. 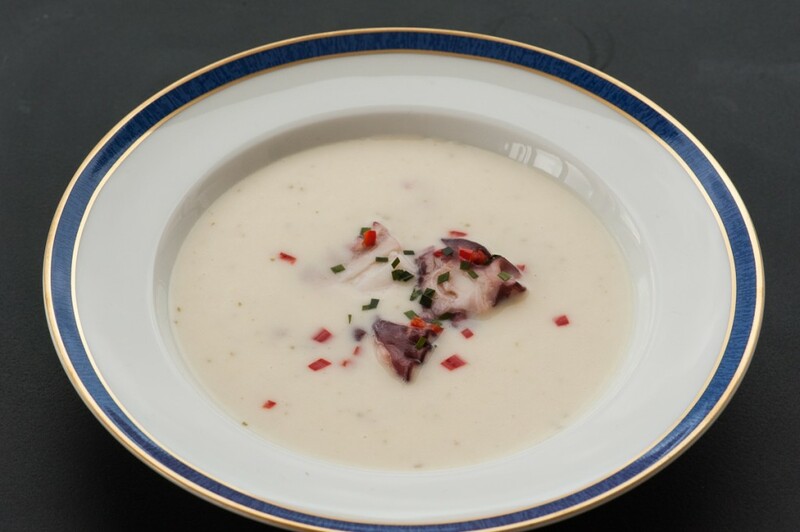 A wonderful soup with a distinct wine taste. Take care in choosing the wine. Sauté the shallots in the butter/oil. Add the frozen spinach and fry until thawed. Add the stock and wine. And let simmer a few minutes. The longer it simmers, the more liquid evaporates and the taste of the wine becomes stronger. Remove from heat and process with a hand held blender. Return to heat. Taste. Add more water/stock if needed. Add a few drops of Tabasco, salt and black pepper. Simmer a few minutes. Taste and add more seasoning if needed. Stir in the crème fraiche and bring to a boil. 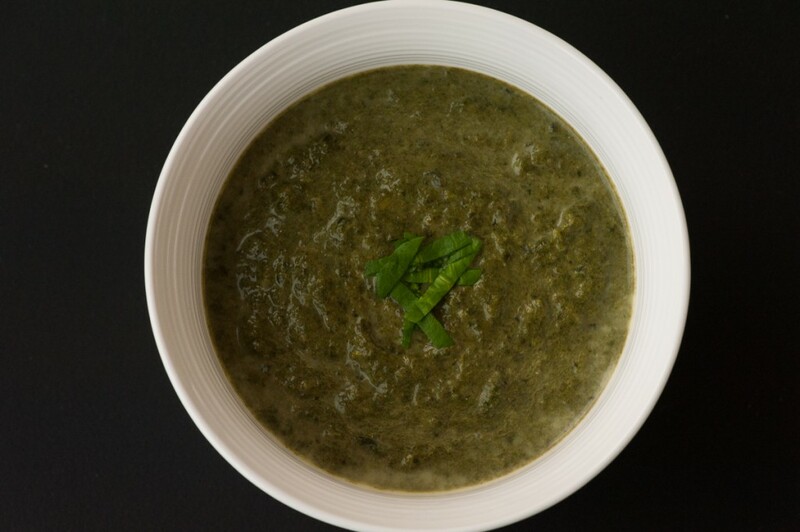 Shred the spinach leaves, sprinkle over soup. Quick and delicious! One of my favourites. Creamy and as spicy as you’d like. Can be made dairy free and low fodmap if you leave out the crème fraiche topping or just substitute it. (Low fodmap: you can use some tofu cream cheese whipped up with some rice milk to make it smooth, use lactose free creme fraiche or use some soy based sour cream – if based on soy protein, not whole beans). Add all ingredients (except crème fraiche and chili flakes) and let simmer for 15-20 minutes. 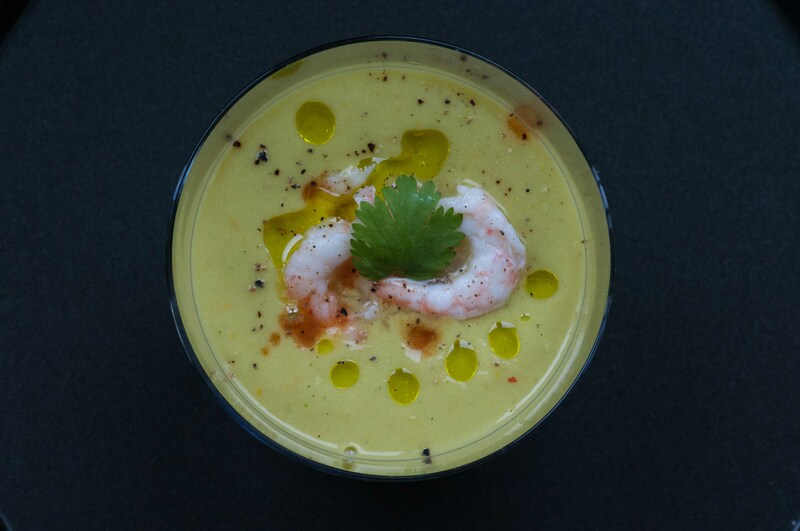 With a handheld blender, mix into a smooth soup. Add some salt if needed. Serve with chili flakes on top and a dollop of whipped crème fraiche. A mild soup, full of flavour. To be served as a starter, or, with some fresh bread (please see our potato bread), as a lunch. In a pan, fry the peppers and onion in the butter until soft. With a spoon, place small droplets of cream in the soup. 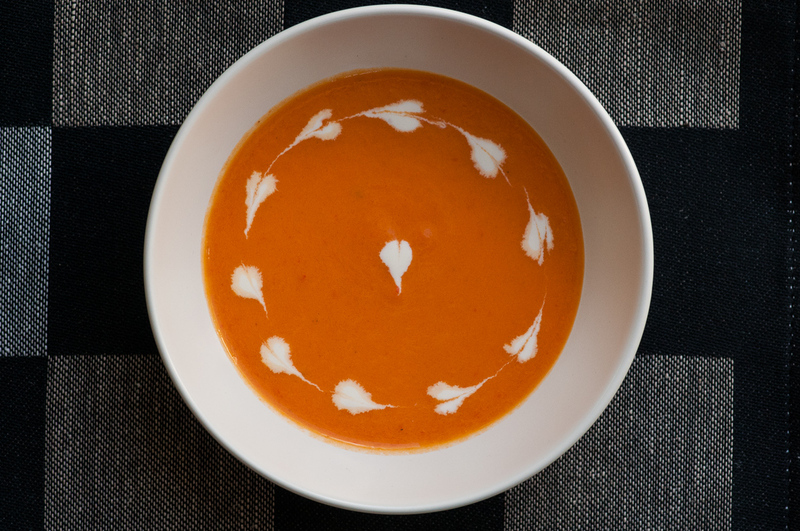 Use a sharp knife to swiftly cut through the droplets thus creating heart shapes. A cold and refreshing ending to a dinner. Can be served in small bowls or in shot glasses. For a variation on the topping, try the Crumble I posted last week as part of the Berry Crumble Yogurt recipe. Place all ingredients for the soup in a blender and process until smooth. Spread the coconut on a baking parchment and roast in the oven (225C) for 6-8 minutes. To avoid burning, stir often. Serve the soup in bowls (or shot glasses) with the topping. 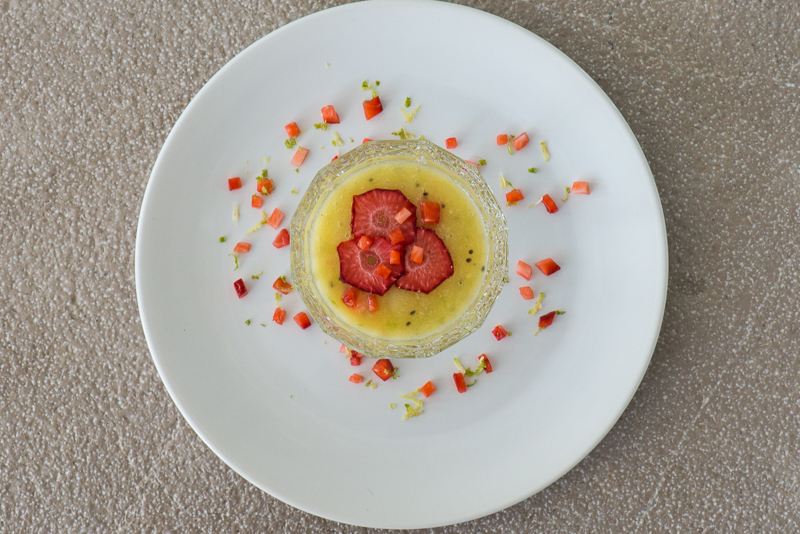 A very festive starter for a summer day, pleasing to both the eye and the palate. The Tabasco sauce is decorative but also quite hot so use with care. This recipe is best made a day in advance. The citrus juice prevents discolouring. To be served chilled. Place the avocado pulp, lime juice, lemon juice, garlic, chili, tomatoes, cucumber, onions and fresh coriander leaves (save some leaves for the garnish) into a blender and puree until smooth. Gradually add the chicken broth until you have desired gazpacho consistency, thick but not too thick. Cover with cling film and refrigerate for several hours. Before serving, pour into small (the soup is quite rich) bowls. Place crayfish tails on top, some drops of olive oil and Tabasco, a few coriander leaves and some freshly ground black pepper. 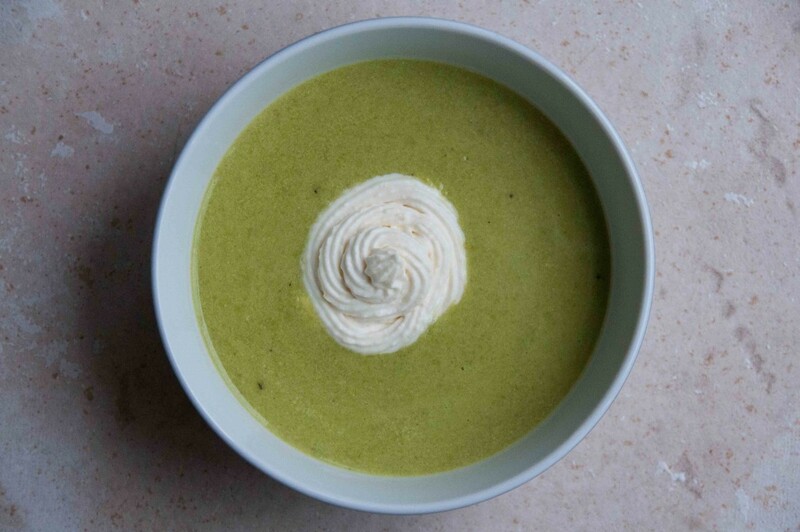 Pea soup may not sound too exciting but this dish is always very popular with my dinner guests. The vermouth is crucial and it really needs to be Noilly Prat. The horseradish makes the soup a bit spicy. Let the Baked Fillet of Hake with Gremolata follow this Pea Soup, and for a dessert I recommend the Roasted Fruit with White Chocolate. Sauté the onion in butter. Add the peas, the chicken broth and Noilly Prat. Let simmer for a few minutes. Then puree with hand mixer so it becomes a smooth soup. Add the crème fraiche. Bring to a boil and let simmer for a few minutes. Take off the heat. Whip the cream, add sour cream and grated horseradish. Serve in small bowl with a dollop of horseradish mix on top. Roasted tomatoes provide a great base for a soup. The balsamic vinegar gives sweetness while the harissa paste provides some heat. For a Sunday menu, why not serve an appetizer of Stuffed Mushrooms, followed by the Roasted Balsamic Tomato Soup together with Oat and Raisin Rolls and with a sweet ending of Raspberry Pie with Crème Anglais. To skin the tomatoes, cut small cross at one end of the tomatoe and let simmer in water for a minute. The skin will curl up and can thereafter easily be removed. Quarter the tomatoes and place on oven tray. Sprinkle with basil, garlic, balsamic vinegar and olive oil. Let roast in 180C oven for 30 minutes. Place in a pot and add a bit of the stock. 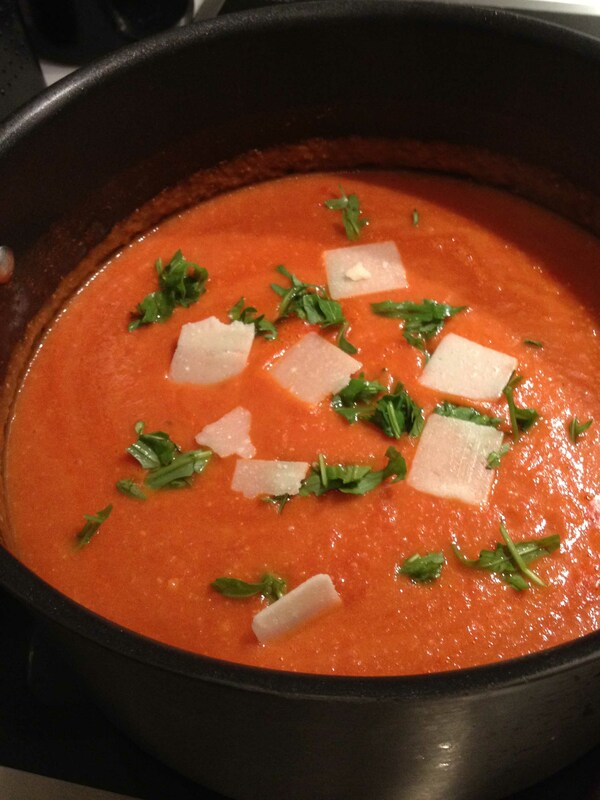 With a hand held food processor, puree the tomatoe mixture. Add the remaining stock and the harissa paste. Let simmer on low heat for 10 minutes. If needed, add some black pepper. Serve with basil and Parmesan shavings on top. This is a great dish to start of your saturday dinner. The flavours from carrot and ginger go great together. Serve with the glazed duck and finish off with a raspberry soufflé. This soup can also be served as a main course. You can then boil some lentils as well and combine with the cheese and leek mixture. 1. Fry the carrot, ginger and garlic in olive oil in a pan on medium heat for about 5 minutes. 2. Add water, vegetable stock and milk. Let simmer for another 10 minutes, or until the carrot is soft. Mix in a robot coup. Taste and season with salt and pepper. 3. Chop the leek and mix with crumbled feta cheese. Add a scoop to each serving bowl. 4. 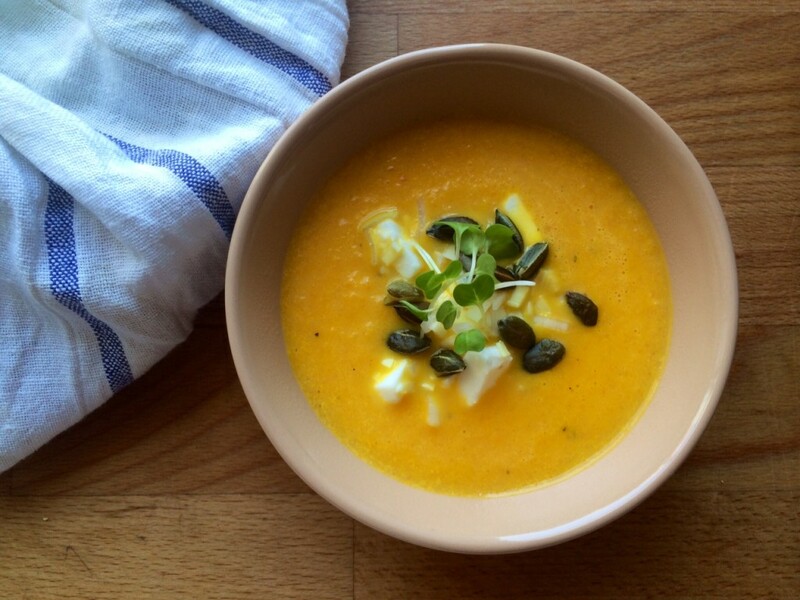 Add the soup to the bowl and decorate with pumpkin seeds on top.